Movement towards unity is the heartbeat of ecumenical work. The desire for unity is a gift inherent in every person/Christian, therefore, the task of stoking the passion for unity work is the task of the NCCP. These persons and groups will be participants and bearers of the ecumenical movement, thus making it their own. The NCCP, therefore, is a facilitator for the movement for unity. The Program Unit on Christian Unity and Ecumenical Relations (CUER) explores bilateral and multilateral relations with church bodies, government and non-government agencies, and people’s organizations in in matters of Life and Work. It nurtures provincial/regional ecumenical councils for the promotion of the grassroots ecumenism. Outside the domestic sphere, it promotes and oversees bilateral relations with other National Councils of Churches or National Christian Councils in the world. The CUER initiates interfaith dialogue and solidarity with Muslims for peace and understanding. It advocates and promotes indigenous peoples’ concerns to churches and policy-making bodies within the framework of stewardship of creation and resisting development aggression e.g., mining by multi-nationals; empowerment and self-determination; direct services in organizing and mobilization; and, continuing reflections on IP spirituality among the churches and with the World Council of Churches. The CUER facilitates and ensures the annual celebrations of the Week of Prayer for Christian Unity, Ecumenical Witness Sunday, Ecumenical Easter Sunrise Service, and other Ecumenical observances. 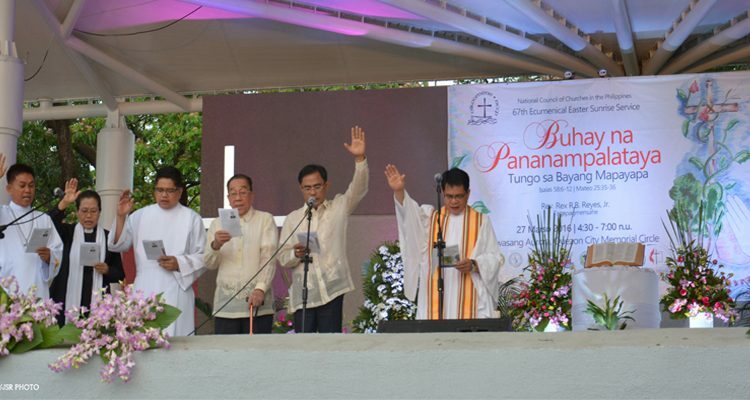 Moreover, it has an oversight function on the Ecumenical Chaplaincy in the Armed Forces of the Philippines and the Philippine National Police as well as the ecumenical ministry in the University of the Philippines.